Lakshmi ~ Flow Of Prosperity: “This card indicates that your prayers about finances have been heard and answered. Tap into your manifestation power by focusing on abundance instead of worrying about money. You have nothing to fear. A new flow of prosperity is supporting you and your loved ones. Additional meanings of this card: Stop worrying about money; worries only attract more money problems. Everything is going to be OK, especially with respect to your finances. You have the support to make a desired life change right now. Visualize and affirm prosperity daily. 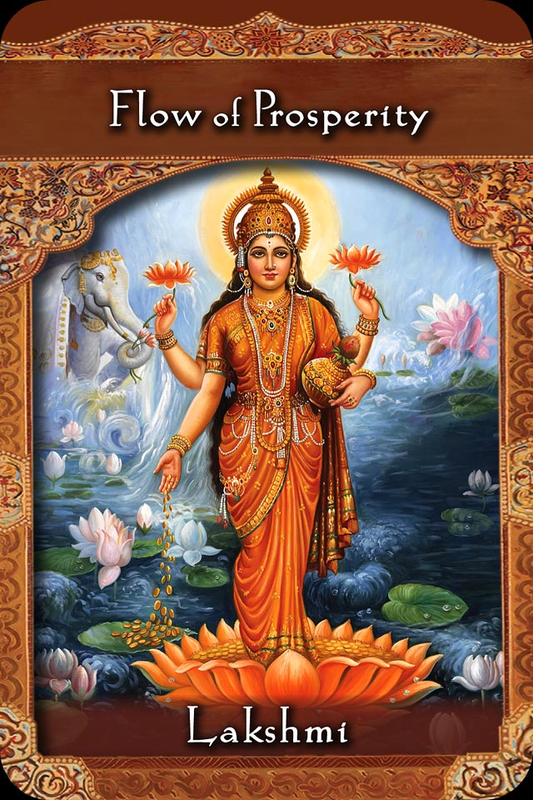 Look carefully at this card and feel the energy of Abundance and security flowing from Lakshmi; who loves you and wants to help alleviate your fears about money and financial stress. As she pours an unlimited amount of golden coins she invites you to receive; in order to receive you must open your heart and your mind in faith and trust. Know that the Universe will provide. Know that you are fully supported and that by setting your sights high, you raise your vibration and attract what you desire. If you are struggling to have your basic needs met, work on affirming your security daily. Keep these affirmations to yourself if there is anyone in your life that would doubt you, work first on your own needs and then you can radiate out your conviction when you are more steadfast in your confidence. Do no let anyone shoot your dreams out of the sky by focusing on the current reality. Your current reality is a manifestation of previous thoughts and worries! Start NOW with your new thought patterns, it is never too late to tell the Universe that you have finally learned how powerful your thoughts are and you have now decided to manifest only your dreams and no longer wish to manifest your fears by dwelling on them! Are you getting the beautiful simplicity of this? Focus all of your attention, excitement, anticipation and joy on WHAT YOU WANT, need and DREAM of. Let everything else go. Sounds easy right? Yet how often do we stick with it? Are a few great thoughts often followed by a “reality check” only to take you lower than you started? The Universe is a magical place and we must tap into it’s full potential by ordering up only what we want! Imagine again (this is one of my favourite analogies) going to a restaurant and telling the waitress all the things you don’t like and don’t want and had last time! How confused would she be on what to bring you? Would she bring you what you say that you “always get”??? Probably!!!!! OR you can go into the restaurant and order your absolute favourite thing on the menu, every time. Regardless of price. What are your ordering from the Universe? Lakshmi is here to offer her abundance and prosperity…. would you like some? How much? I AM prosperous. I AM abundant. I AM fully supported by the Universe; all of my financial needs are met and exceeded.